The Lapidarium of the National Museum holds one of the richest collections of sculptured stone monuments in the Czech Republic; it is also among the oldest specialized collections of this kind in the country. It concentrates on works of stone carving, architecture and sculpture from the early Middle Ages to Historism, which means the long period from the 11th to the late 19th centuries. Free admission: Children up to 6 years; children from children’s homes or SOS children’s villages; holders of physical disability cards (ZTP, ZTP/P and people accompanying them; ICOM, ICOMOS, the National Museum Society; holders of the Benefit card of the European GNSS Agency – the Ministry of Transport, Prague Card. Although the National Museum was founded in 1818, and as early as in 1839 the historian František Palacký, himself an important figure in the museum’s history, emphasised in the museum’s programme the importance of saving and collecting the originals of works of art in stone from the disappearing monuments of architecture - in particular memorials, tombstones and reliefs - an independent Lapidarium collection was constituted only in 1898. 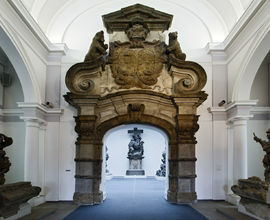 Some of the exhibits we can nowadays admire in the Lapidarium were already exhibited in 1846 in the museum halls in the Nostitz Palace on Na Příkopech street. On the occasions of the Jubilee Exhibition in 1891 and the Czechoslovak Ethnographic Exhibition in 1895 further collection items were acquired, and in 1898 they became the basis of the Exhibition of Monuments of Old Architecture and the Exhibition of Architecture and Engineering, which took place at the Prague Exhibition Grounds. 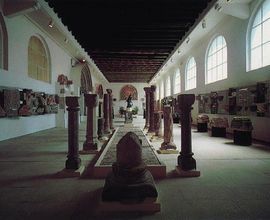 The exhibition was installed in the originally Neo-Renaissance Pavilion of Retrospective Exhibitions, designed by the architect Antonín Wiehl for the Jubilee Exhibition in 1891, which, since its reconstruction in Baroque Revival style and many modifications, has housed the Lapidarium collection to this day. The reconstruction of the pavilion in 1908 included, among other things, the Art Nouveau relief and sculpture decorations of the building’s exterior by František Hergessel. 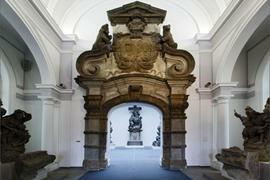 The collection items in the Lapidarium come mostly from Prague and Central Bohemia. During the reconstructions of the individual buildings, and also the demolitions of entire city quarters, many valuable pieces were saved and passed to the National Museum. 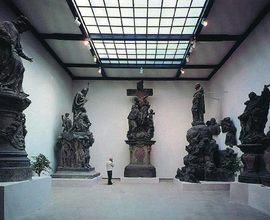 The museum, therefore, acquired the most extensive sets of stone carving works and sculptures between approximately 1890 and 1930, during the period of redevelopment of old Prague. The irreplaceable monuments come from demolished churches (the complex of St. Vitus Cathedral, Vyšehrad), aristocratic palaces and burgher’s houses, and also archaeological and building surveys. Due to modernization and transportation, monuments and fountains that stood in the way of traffic on new crossroads and tram lines (Krocín Fountain on the Old Town Square, the Monument to St. Wenceslaus with a fountain in the Horse Market Square, the Monument to Marshal Radetzky on Lesser Town Square) had to be removed, and they found a place in the museum. The memorials and monuments associated with the Habsburg Monarchy, which were either spontaneously or deliberately removed after the declaration of the independence of Czechoslovakia in 1918, found asylum in the Lapidarium (the Marian column on the Old Town Square, the Memorial to Francis I). Many precious sculptures have entered the Lapidarium‘s collection in recent years, after the originals were replaced by copies (the sculptural decorations of the Old Town Bridge Tower and the Charles Bridge). The first independent exhibition in the Lapidarium, prepared by museum employees Jan Koula and Václav Fabián, was opened to the public in 1905, but after the outbreak of World War I in 1914 it was closed again. The Lapidarium was opened again, after many years, in 1932. The exhibition that was installed, in quite a modern style for its time, served the public only until 1939, when its operation ended due to the war. 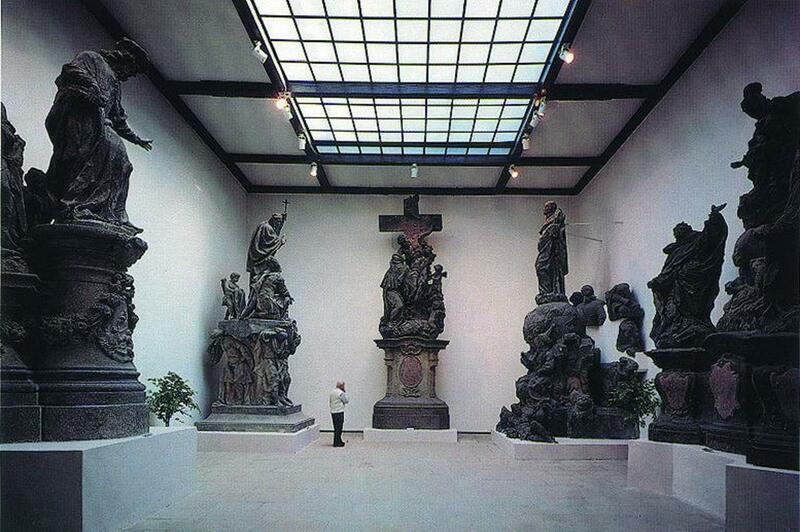 The Lapidarium collections opened again to the public between 1954 and 1967. The present shape of the exhibition comes from 1993, and its organization and selection of exhibits puts it among the leading European collections of its kind. In 1995 it was awarded the title of European Museum of the Year. 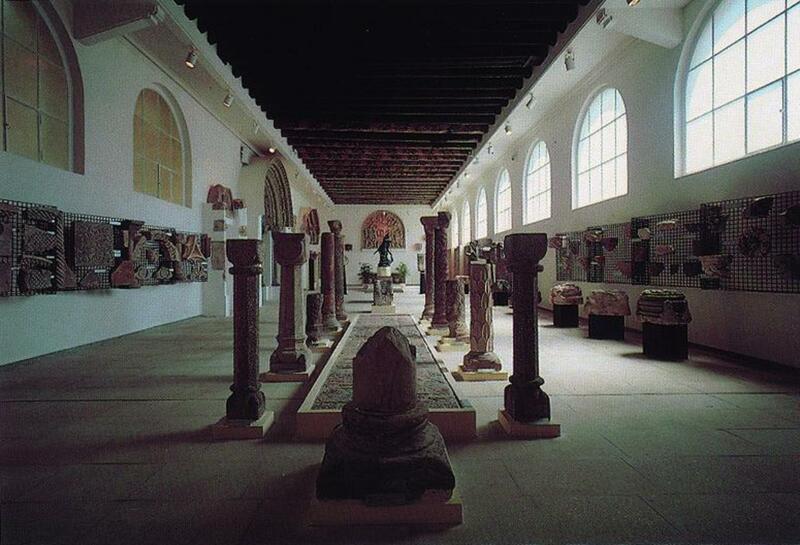 The Lapidarium is also used for the presentation of artistic projects, lectures and concerts. The building is wheelchair accessible, including toilets. It is located at the ticket office on the ground floor.